You might not realize that dogs don't sweat the same way as we do. Cooling down is actually a much more laborious act for our four-legged companions that you might assume. Add in a thick double-coat designed to protect your Shiba Inu from the bitter cold heights of Japanese mountain ranges, and you have a recipe for heat stroke or other heat-related incidences. Depending on your location and without plenty of water and shade, your Shiba Inu may be quite uncomfortable in the heat. This might not be an issue if you limit your Shiba's exposure to hot temperatures or if your Shiba is not especially active. However the issue of heat is more serious if you live in a especially hot area and / or your Shiba Inu is highly active via hiking, running, and long walking trips. 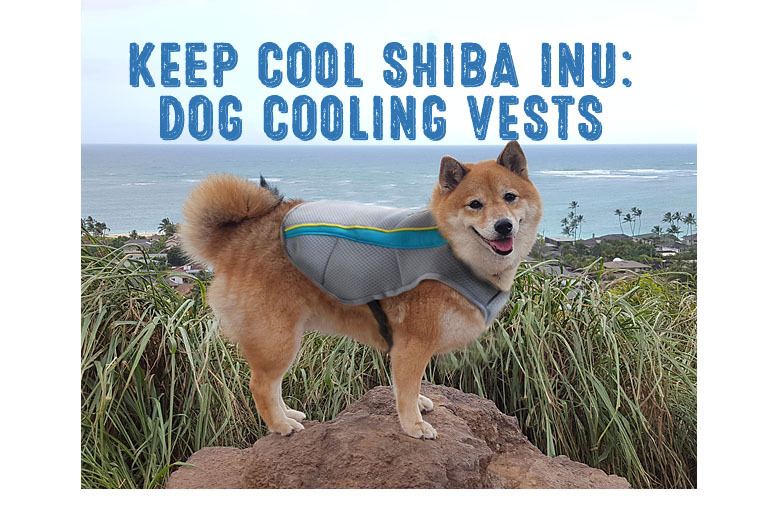 Though there are ways to keep your Shiba Inu cool in the summertime, one of the best new ways to tackle the heat is by using a dog cooling vest. What are Cooling Vests for Dogs? Cooling vests are basically vests that have been designed specifically for dogs to cool down the core temperature of their body. By the process of evaporative cooling, the vest accelerates the rate of evaporation of sweat from your dog’s body. Cooling vests don’t require any batteries or power source, and they are very easy to prepare and use. How Do Dog Cooling Vests Work? As mentioned above, cooling vests use the same principle to cool your Shiba Inu as your body helps you stay cool in the summer: evaporation. Using the human body as an example, when we perspire, sweat evaporates and pulls excess heat away from the body. A dog cooling vest works using the same principle. The vest cools a dog from the inside out, accelerating the process of evaporative cooling. Since the key area to keep cool on dogs is the back and chest, cooling vests and collars work extremely well. However, because the process of evaporative cooling is all about drying, cooling vests are not as effective in humid regions as they are in dry heat. 1. Soak the cooling vest in a basin of cool water. Keep it submerged for several minutes. 2. Rub the vest to help it absorb water faster. 3. Once completely saturated, remove the vest from the water and squeeze the excess liquid from it. Pat the vest dry. 4. Place the vest on your Shiba Inu. Adjust the neck and chest straps to ensure that your Shiba can't wriggle out of it. You don’t need to refrigerate the vest, but if you want to really make the vest cold, you can place it in the refrigerator. 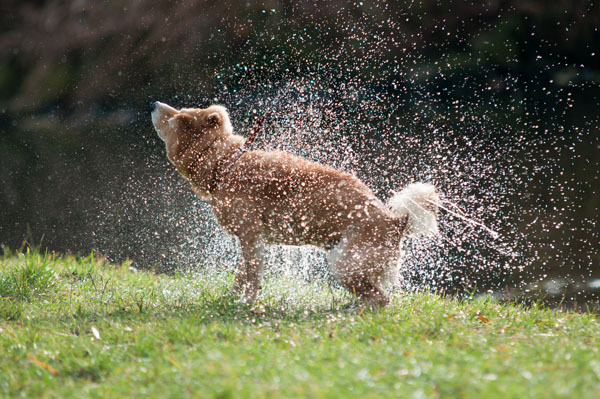 Avoid using ice water if your dog is showing signs of hyperthermia (heat stroke). Remember, cooling vents are not designed to treat heat stroke, nor can they prevent hyperthermia and exhaustion alone. You need to follow proper guidelines to ensure your dog stays safe in summer heat. Dogs of all ages and sizes can wear cooling vests. Never leave your dog alone in a car, even with the vest. This is dangerous. Understanding how cooling vests work might be simple, but choosing the best one for your Shiba Inu might be a challenge. The main feature of dog cooling vests is the fabric. Vests are made from highly breathable materials like 100 percent cotton (terry cloth), which can hold up to 400 times its weight in water, and a nylon outer layer that repels water. Cotton is also non-toxic and won’t cause irritation if chewed or swallowed. You want to find a vest made of such material. It should also be lightweight and comfortable to wear. Another common material is breathable PVA mesh. Also, you don’t want material that will get too soaked and leak water all over your dog’s coat. Water on their fur can be annoying and even cause chafing. Sizing a dog cooling vest comes down to the length of the back of the neck to the base of the tail, covering all vital organs. The correct size is important, because it will ensure comfort and maximize the cooling effect. To find the appropriate size, take the girth measurement of your dog first then compare everything else. Some vests look more like an elongated harness with side-release buckles. Others might be zip-up models. A cooling vest that dries within moments isn’t going to help anyone. Minimally, a cooling vest should provide at least an hour of cooling. The ones that are truly worth your money, however, should be those that provide 5-10 hours of cooling per soaking. Though it is a small element, a cooling vest can quickly go from convenient to a nuisance if it doesn’t fit around a leash or harness. A few designs may feature a leash clip so you can even use the vest itself as a harness. Other design components to consider are how many layers of cooling materials the vest is made out of, where the cooling effects are concentrated, and ease of movement (i.e. size of the leg holes). The best cooling vests will not only using evaporative cooling to keep your dog cool, it will also reflect the rays of the sun away. This will help your Shiba Inu stay even cooler. While many people will be using the cooling vest during the day, reflective strips on the vest are a nice plus whether your are out in the waning daylight of peak summer or running home in the dark on a hot October evening. Safety of course, is always first. 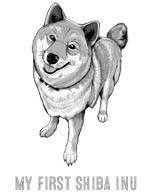 Now that you know what to look for, you should have no problem finding a vest for your Shiba Inu. Keep in mind that following the sizing guide for all vests is essential. Aside from strapping on a cooling vest, there are other ways to keep your dog safe from summertime heat-related dangers. Although you might not always be able to find complete shade, make every attempt you can to time your dog outings for times that are not too hot out. Not only will shade protect your Shiba Inu from the damaging effects of the sun, but the pavement and ground will be cooler on their paws as well. 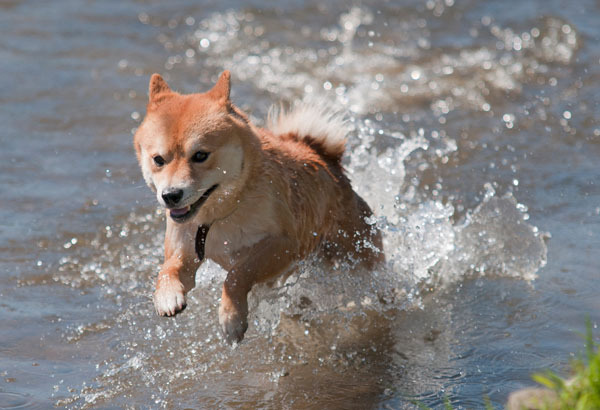 Always provide enough water for your Shiba Inu during summer. If you and your Shiba Inu are very active, stop for a water break every 15-30 minutes, depending on how much panting your good boy or girl is exhibiting. Be careful never to exert your Shiba Inu beyond its abilities. Older Shiba Inus need more rest breaks and should not be subject to overly strenuous walks or hikes. Have you ever had to walk barefooted on dark gravel pavement during the hottest time of the day? You probably never had to as that would be a crazy thing to do. You shouldn't subject your dog to that scenario either. Although most dog paw pads are a tad- tougher than human feet - they still are sensitive to hot walking surfaces. Protective booties can help, but since most breeds vent through their feet, booties on extremely hot days may also be a disadvantage, so beware. Yes, there is such a thing; and it can be a boon. 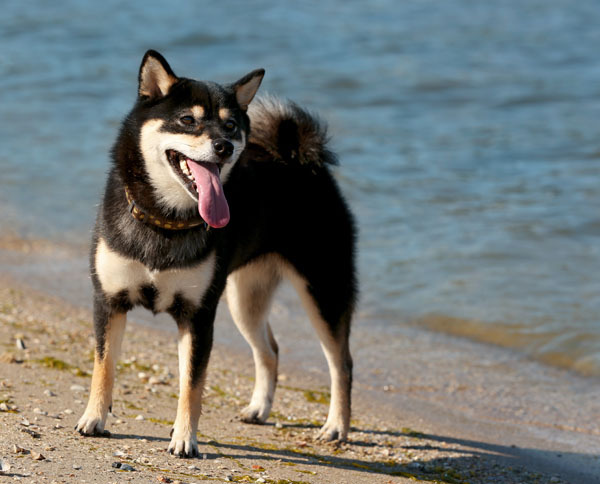 Since most Shiba Inu have light fur and skin, they are at the risk of getting sunburned. If you don’t have dog sunscreen, children’s non-toxic sunscreen will also help. Dog cooling vests and collars are an excellent method to ensure that your furry Shiba Inu is going to stay safe in even the hottest and most humid conditions. While drinking cool water and having shade might stave off heat exhaustion for a short while, it is only a matter of time before the Shiba Inu’s thick coat gets the better of them. That's why the extra cooling of a dog cooling vest may be just the thing to offset the heat and ensure your Shiba Inu is comfortable. The Ruffwear Swamp Cooler dog cooling vest is one of our top choices in cooling vests. The outer layer of the Swamp Cooler reflects the sun's rays while the middle layer cools down your dog's body temperature . We especially like the easy to put on and take off design of this vest via side release buckles. The Ruffwear Swamp Cooler is compatible to wear with other popular Ruffwear harnesses such as the Web Master (a great no escape harness). This harness can be washed in the washer on a gently cycle. Hang out to dry. In terms of sizing, most Shiba Inus will either be an XS or small as these vest do run a tad large. Check the latest price of the Ruffwear Swamp Cooler, Cooling Vest here. The SGODA Dog Cooling Vest Harness Cooler Jacket is similar to the Ruffwear cooling vest in technology and design and lower in cost. This dog cooling vest runs a bit larger than the Ruffwear so be sure to measure your dog carefully before ordering. The SGODA cooling vest is pretty sturdy and can be used as a harness via it's zinc allow D-ring on the back. This harness has a zipper enclosure and is pretty simple to put on and take off. Check the latest price of the SGODA Dog Cooling Vest here.